When we travel, we spend time in advance planning for what we will do to fill our days. We try to find interesting things to see and do along our route, as well as look for the hidden gems that our destination has to offer. On many trips, we have seen many unique and interesting things that I wouldn't have known about with some research. As example, when we went to New York, many years ago, we went on a boat ride in an underground lake. With all of the research and preparation we do for travel, I find it interesting how you can live in a community or part of the country for years and never really find all of the local hidden gems. Is that your experience? We live in North East Ohio, not far from Cleveland. We know many of the "basics" - there is the science museum in Cleveland, a zoo in Cleveland and Akron, used to be an inventors museum in Akron, and there are baseball teams in both Cleveland and Akron. Aside from these stand-by activities, we find ourselves scratching our head when we want to head out and do something new and different. I was recently introduced to a book series from WonderDads. They offer books featuring "The Best Dad & Child Activities" in a number of cities. We had the opportunity to check out the book for Cleveland. The book is broken down into a handful of sections - there are Restaurants, Activities, Stores, Outdoor Parks and Recreation, Sporting Events and Unique Adventures. The very first section is the "Best Of" section. It includes top 10 overall best dad/child things to do, and then a number of top 5 lists - including to do on a rainy day, hot day, full day, splurges, and most memorable. Each top 5/10 list includes the page number with information about that item. As I sit here and glance across the list, many I have heard of, some of them I have been to/done, others are no familiar to me. Most of them are in Cleveland, but there are some that would be more of a day trip. In the Unique Adventures section, they do have listings as far away as the Caribbean though. Within each section, the lists are alphabetical by location, which are not specific cities but rather neighborhoods, like Summit County North or Summit County South. For each location, they list an address, a phone number, a website (when available) and then a quick blurb about the location. They also mention some specials or offers. In the activities section, they include festivals as well. Not being from the area originally, I never would have known that there was a Frog Jump Festival or a Potato Festival so close to home! Overall, I found the book to be a nice addition to our home. It gives us the opportunity to find some new to us activities to check out close to home, especially when we feel like we have no ideas. I like that it is all in one place and is organized by type of activity. I think that the "rainy" day and "hot" day lists could come in rather handy on a summer day where the kids are feeling "trapped" by the weather. I think that the guides are perfect for home or might make an interesting travel companion on your next vacation. My only concern on using it for vacation is the way that the sections are sorted by county would make it better for planning in advance than for trying to use it on the fly - at least I don't generally know what county I am in when I am traveling. When you purchase a book, you also get free access from your smart phone for a year, so that you can have access to the content in the book, special updates and more from your phone. I think this would come in handy. Sometimes when we head out, we find ourselves with some more hours on hand than expected and having access from our phone could help us find another local activity or a restaurant to check out. Also, when you purchase a book, 2% of the profit goes to the WonderDads Fund, which helps dad with a sick child take paid time off from work. 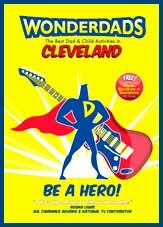 They also have a website (www.wonderdads.com), which provides information on upcoming events and more organized by neighborhood. If you head over to their blog, you will also notice that A Busy Mom of Two was included on the Best Blogs to Tell Your Wife About article. A visit to their bookstore will allow you to check out the different cities that they offer guides for (there are currently 40 locations available), as well as some other "dad" type books. I am thinking of picking up Coach Me Baseball for my husband, since he has been volunteering as a baseball coach for my son's team. One A Busy Mom of Two reader will have the chance to win a free copy of a WonderDads Activity Guide for the city of their choice, courtesy of WonderDads. To enter, visit wonderdads.com and let me know which city you would like to have a WonderDads Activity Guide for. Giveaway will remain open until September 15th at 6 pm. Giveaway is open to residents of the US only. One winner will be selected using a random number generator. The winner will be contacted by e-mail (be sure to leave one!) and will have 48 hours to respond or a new winner will be selected. No compensation was received for this post. Wonderdads provided me with a copy of a the Activity Guide for the purposes of my review and is providing one for a giveaway. All opinions expressed are my own or those of my family. This is a neat way to find out where your readers are from! I would love the Denver addition.